Our team of professional cleaning experts is dependable, and offers a flexible schedule to fit your busy life. 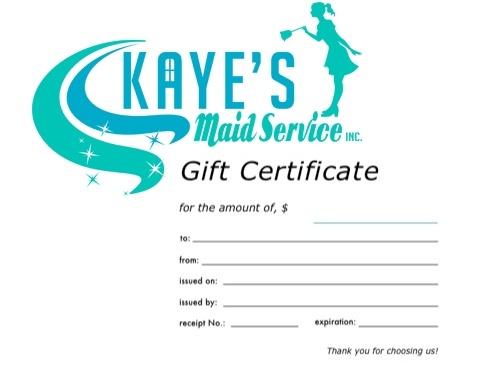 Kaye's Maid Service in Columbus, GA specializes in custom cleaning tailored to your specific needs. We focus on customer satisfaction, using quality products to achieve the results you want. Our expert technicians clean your space with attention to detail, providing you with a sparkling clean environment. You reap the rewards of a healthy, vibrant home or office without stress or anxiety. Our commitment to excellence, combined with our specialized cleaning techniques, guarantee top quality service for your home or office. Experience the joy and satisfaction of stepping into an expertly cleaned space. Savor the peace of mind knowing that your property not only looks squeaky clean, but deep cleaned by professionals that take pride in doing the best possible job. Your environment and the people that enjoy it will be healthier and happier. Let us do the cleaning; you have better things to do! We will schedule a time to walk through the property with you, so we can better understand your needs and get to know what it is you are looking for. Let the leading company in office cleaning business tailor a cleaning program that meets your firm’s needs. Presenting a clean business environment is paramount to impressing clients and customers and improving morale among your employees. Our expert office cleaning staff will provide your company with a worry-free way of maintaining a professional atmosphere day after day. We do the work, so you can concentrate on your business. Whether your company requires daily office cleaning services for your building, or a weekly or monthly service, we will customize a cleaning program specifically geared for your business. Your satisfaction is guaranteed. If the cleaning does not meet your approval, please inform us within 24 hours, and we will make arrangements to have the problem corrected, at no additional cost. All calls and appointments will be scheduled during business hours only. Most customers give us a key to their home or a code allowing access to the garage. Other methods of entry can be arranged, on the day of service, if necessary. All keys are marked for identification with a code rather than an address or customer name. Security is a major concern for us. Our policy is to lock the door while we are cleaning and to not allow access to unknown people. For these safety reasons, please do not ask our cleaning professionals to allow access for workmen during the time we are in your home or if you prefer to be home at the time of service, we also clean houses when owners are present. Since we do not bill our clients, we appreciate full payment on the day of the cleaning service. We accept payment by cash or check placed in a sealed envelope with your name and address to be left on the kitchen counter. A fee will be charged for any returned checks, in addition to any other fees charged by the banks. Other payment options may be available, please contact us. We understand that schedules change. We ask that you contact us no later than noon the day before your scheduled cleaning to cancel or reschedule. Cancellations later than noon the day before are subject to a cancellation fee. The same fee will be charged if we cannot gain access to your home if you have chosen not to leave the company your key. For Monday cleanings, please call our office by noon of the preceding Friday. Also, if you request a reschedule, we may not be able to accommodate your request with the same cleaning team you are accustomed to. Receive a $20 gift certificate for referring a friend! Please contact us to get a gift certificate to give to a friend or loved one.